Ok I'm releasing the full list of packages of this (all the renders, all the SVGs, all the trace layers) for free downloading. Largest PNG render is 19385 x 30000. Oh my this took a long time. Well it's a huge vector traced from a ton of different mashed together screenshots. Looks pretty good too doesn't it? Ponyscape is 's modified Inkscape so you'll need that if you want to use the SVG files with all the AWESOME options. Ponyscape is the easier-to-use, great for any skill level free vector program! 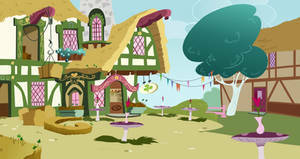 Background traced from many combined screenshots of S3E6 "Sleepless in Ponyville" of My Little Pony: Friendship is Magic which is copyright Hasbro. The vectoring is streamlined and vibrant, and all around is exactly the style of the show. The depth given is remarkable for such a limited 2 dimensional format style! 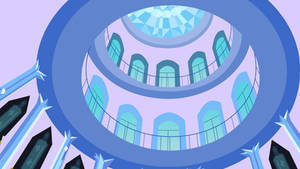 The dual perspective on the cave, as a scene from the show, put against the falls in the back put a strongly relative distance, adding as much realism as possible within a marshmallow-pony universe. The low horizon acts to give more grandeur to the sky, and I personally enjoy the sense of scale from the aforementioned campsite. The blur effects and clouds in the foreground provide a another sense of accuracy. Only some of the background elements could be improved; namely towards the valley below. The perspective is lovely, but the patchwork, surely supposed to define distant properties, is hard to discern, though not detracting. Overall, wonderfully illustrated. ... Today the Winsome Falls is still visited by many ponies as a spectacular sight in itself, although local government officials warns against drinking any of the water at its source. On the other hoof, Winsome Falls did in the end fulfilled its purpose - further downstream, where the magical energies had naturally depleted sufficiently for safe long-term consumption (Note that eventually, unless consumed by ponies or other lifeforms, the water themselves will revert back to magic upon evaporation or at sea within a year), new farming communities were able to thrive off the water that made the lands fertile for farming, among them the now famous farming town of Ponyville..."
--- Ponyland - A Guide to the Principality of Equestria, Edition VI, Chronicle Publishing Inc, Manehatten. Don't drink the rainbows or you'll die form cancer? Blech. I don't WANT TO KNOW what you'd do to Star Hill in Super Mario Brothers RPG! All kinds of energy are dangerous in concentrated amounts. 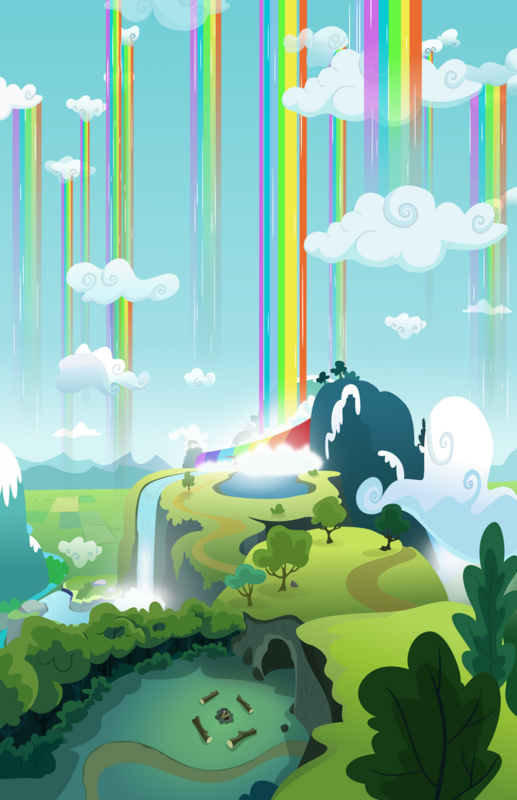 I don't think I can think of a better explanation for rainbow waterfalls from clouds at Winsome Falls other than an ancient pony agricultural geo-engineering gone wrong. You'd have the G1 ponies all getting freakin' cancer for playing in rainbow colored pools and slide on rainbows. And the G3 ponies getting cancer for flying through a rainbow waterfall, and eating rainbow berries that are directly connected to the rainbows of Ponyland. I always have them as separate continuities in my headcanon, parallel universes with different laws of magics and physics/chemistry/biology. So how would the falls work in THOSE them? 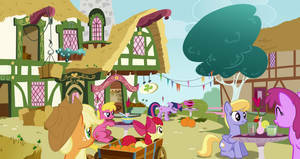 Greatest background scene in MLP for Dashie & Scoots. this is beautiful. I had no idea one could do such things with vectors. If you like this then you'll probably like my other backgrounds. I recommend going through the MLP Vectors folder of my gallery. Can I use as a background? There is one thing: You can't offer things I use for sale. That's the Non-Commercial part of the Creative Commons license. That's why there is 5 lovely download packages for you depending on what you need to download! Also that's why there's a Creative Commons license on it! Otherwise amaizing work!! I really love this scene in the series and you portrayed it marevlously!! This work is licensed under Creative Commons Attribution-NonCommercial meaning as long as you say I did it in the description you can use it for whatever you want and modify it at your whims. I do however ask you please never use anything I do for NSFW-type projects. Ohhh but of course ^^ many thanks!! OMG this is something I don't see everyday ... Simply beautiful ! Yeah not many people saw it when it came out. It's still pretty unknown as far as things go. But it's lovely and I love it. That's pretty boss. Given the annoying amount of work tracing can be, that had to take forever. How does Ponyscape stack up against AI? I tried Inkscape and found it nearly unusable on OSX. I'm about to embark on a fairly intensive vector-art project involving ponies and would love a tool that is faster to produce with than AI. Thanks for the accolades. It did indeed take forever. Both AI and Inkscape/Ponyscape are good programs. It's just that Inkscape/Ponyscape is loads better in many ways such as freedom, render capability, and system taxing (not to mention customization). The good thing is that you aren't using photoshop....which isn't the best. I can't stand using PS for vectors I only use it for painting and drawing. I tried my best at this, still my current magnum opus. 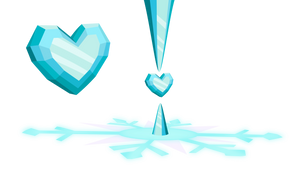 You've probably never seen it because none of my vector stuff has ever been featured on EQD, but you can find it used in everything from amateur projects to the center of one of Galaxy Art's montages. wow, it all looks really awesome! Thanks! Feel free to download it, use it, and have fun with it. That's what it's here for! Thanks. I piece this together from many, many different screenshots. What was special though (besides my attention to the effects) was the perspective editing I did to them. It took many weeks of inconsistent work but I got it done over late December. Oh and that was a very bad pun ^-^....thanks! Wow! You made this from screenshots?! that's crazy! It looks amazing. Congrats again! Speaking of which, if you look further down in the comments, in my reply to Wooden-Flashlight there's a link to the original screenshots in which somebody directly says "You crazy". But why not just give you the [link] again? looking at these two side by side gives me a new appreciation for this piece! one question though... how do you remove the hub logo so well? While I don't been steal credit from Hasbro or the DHX team, the Hub logo is easy to remove when you vector over it. You just have to remember that it's there on top of what was originally there, and it's not changing that. Anyway, that wasn't my only trace layer. I have many, many more that I used for spot-checks, proportion management, the cloud rainbow field has another one, all the mist effects have a special enhanced inverse layer to check how their effect works. I like your time-lapse vector videos, too! Thanks. I can't do them for everything (multiday projects generally not) but I try to get them for stuff! Now, this is what i call awesome, it is clear you put a lot of effort into this and it surely paid off!